Two words you never expected to go together probably include Ninja and Monkey. Ninja Monkey slot is a 5 reel 35 payline slot by Inspired Gaming. It combines wildlife and Asian culture in one place. The cartoon styled slot has amazing features like expanded wilds, expanding reels, free spins, random extra wilds and more. It’s easy to score wins during the base game because there are only 6 standard symbols. You can land Mystery Symbols, wilds and more. Inspired Gaming isn’t as popular as companies like Microgaming and Playtech. However, they are highly underrated. The company has employed more than 10,000 people all over the world and also has almost 50,000 gaming machines installed in almost 30 countries. The company is based in the UK and is fully licensed. Inspired Gaming is an advocate for fair play and is certified by the local Gambling Commission for being reliable. The Ninja Monkey slot has a great design. The action takes place in a mountainous setting. Tall rocky mountains sit in the background with the sun setting just behind them. Our ninja is hanging out on a cloud and is surrounded by bamboo trees. Symbols on the reels include nunchucks, koi fish, throwing stars, daggers and a bonsai tree. The throwing stars, nunchucks and daggers pay out lower values. The highest paying symbol is the game’s logo which can pay up to 1000x the line bet when you land 5 in a row. Wild symbol- A group of dangerous-looking swords are considered the wild symbol of the game. These can replace all the other symbols on the reels. This symbol won’t give you a payout on its own. It can replace the monkey which usually ends up unlocking the bonus features. Mystery Symbols- These appear randomly during a spin. When they do and the reels stop, all of them on screen transform into one single standard symbol type which can complete extra paylines. Fortune Bet- If you choose this feature, you give your stake a 50% boost. You also get twice as many chances to land the bonus feature as the monkey symbol gets twice as bigger. If any 3 bonus icons land at the same time, you get free spins as a reward. The monkey lands on the reels at random and creates stacked wild reels. Free games- You can retrigger the free games by landing 3 or more bonus symbols on a single spin. You not only get an extra bonus round, but the rows increase to 4. This doesn’t increase the number of lines in play. It’s easy to form winning combinations in the more expanded format. It gets better when you retrigger another bonus round which makes the reels expand again to a total of 5 rows. This continues until you make it to the maximum of 8. 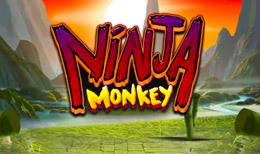 Ninja Monkey has an interesting story plus great design features. During the base game the reels might seem a little squashed. This slot is centered on the expanded reels in the bonus games. It’s a little difficult to get 8 rows on each reel, but many of the symbols are present so there’s the hope that you can win from the stacked wilds.